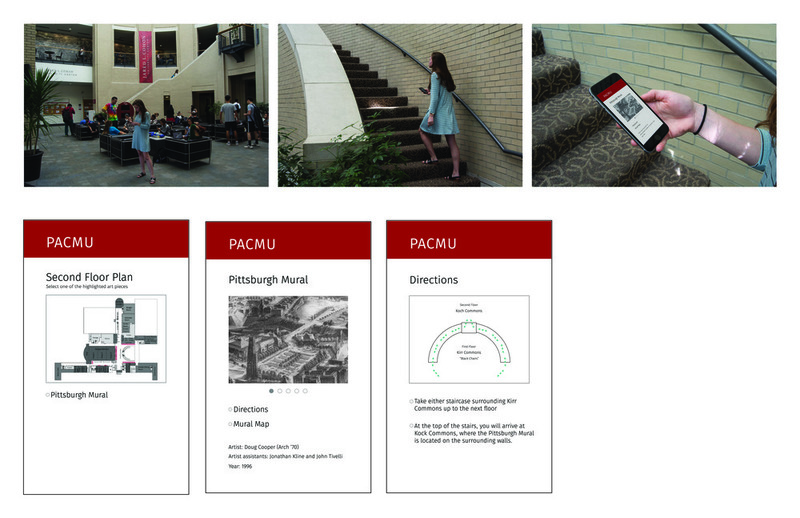 A redesign of a mobile application that connects Carnegie Mellon University to Pittsburgh and the city's culture through an exploration of the public art on campus. 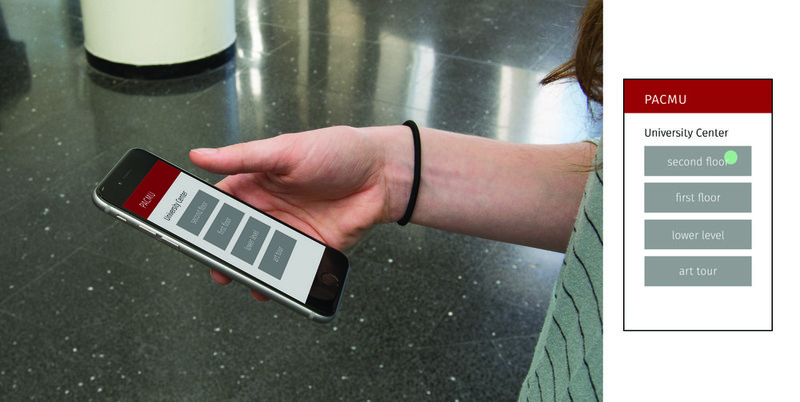 The mobile app merges with the physical space to create a hybrid environment. 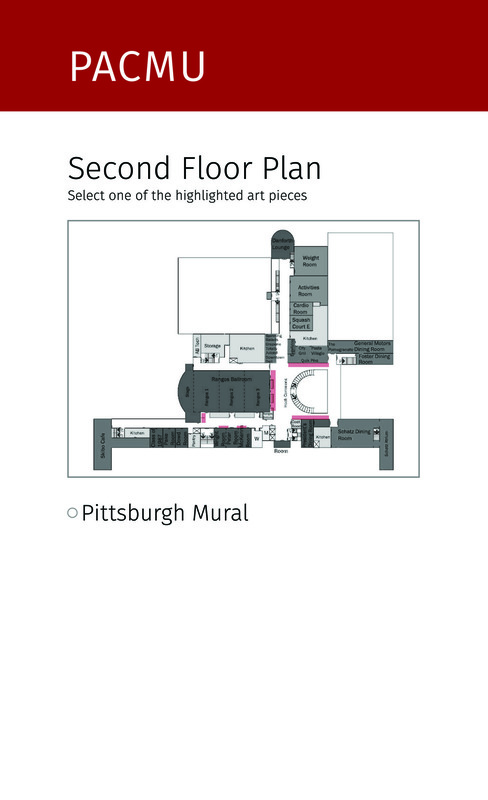 The original application only incorporated google maps in order to give any sense of relative location to the artwork on campus. 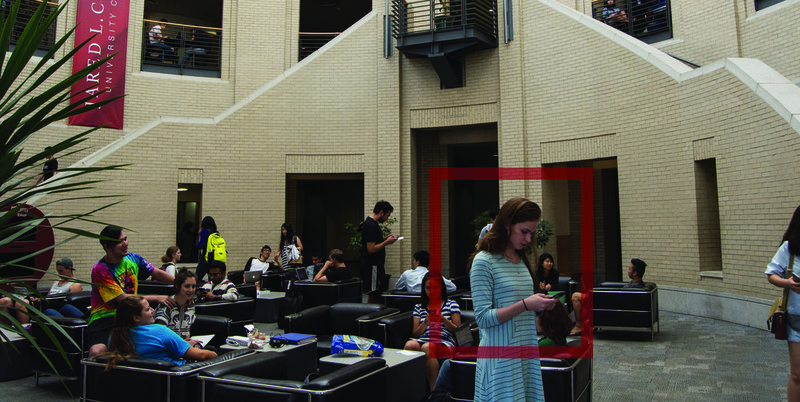 On site observation allowed me to go deeper into the connection between physical location, navigation, and digital instruction. Annotating a map of the environment served as an artifact to refer to later. The focus remained on one route and one destination in order to go deeply into the interaction. 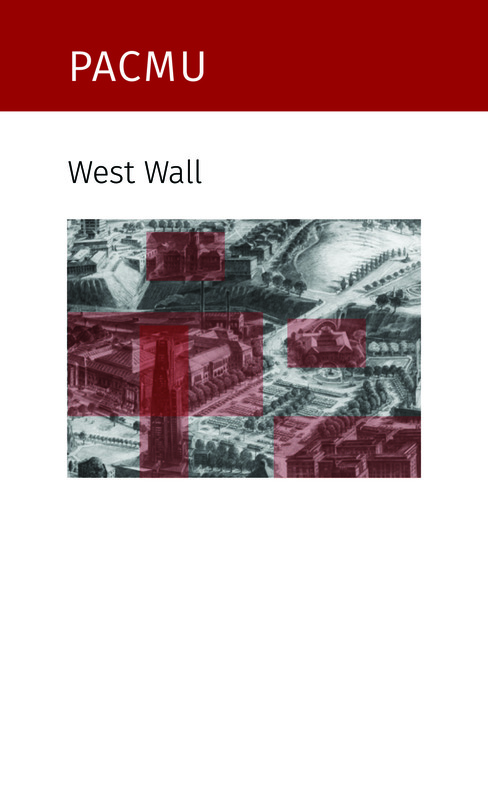 Goal: understand the parallels between the physical and digital environments. The rough storyboard was created immediately after walking through the space. I created a narrative that centered around one piece of artwork in order to narrow focus and communicate the purpose of the app. 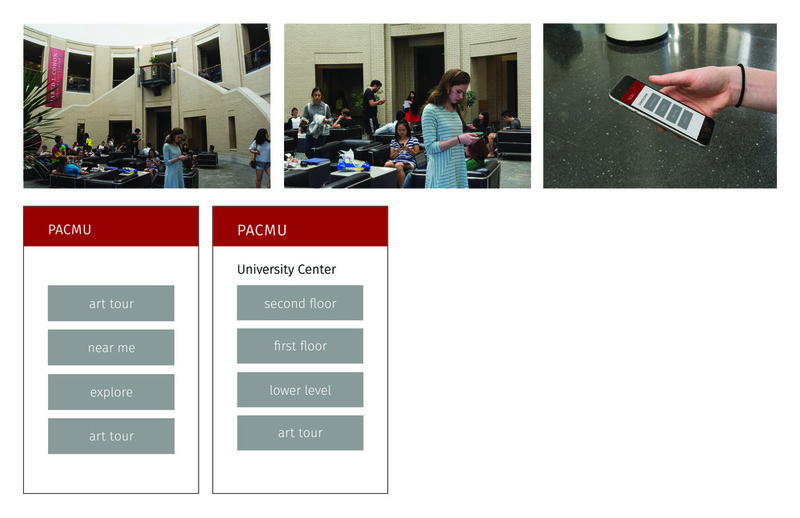 The layering of photographs and wireframes allowed for direct correlation between the two environments throughout ideation. 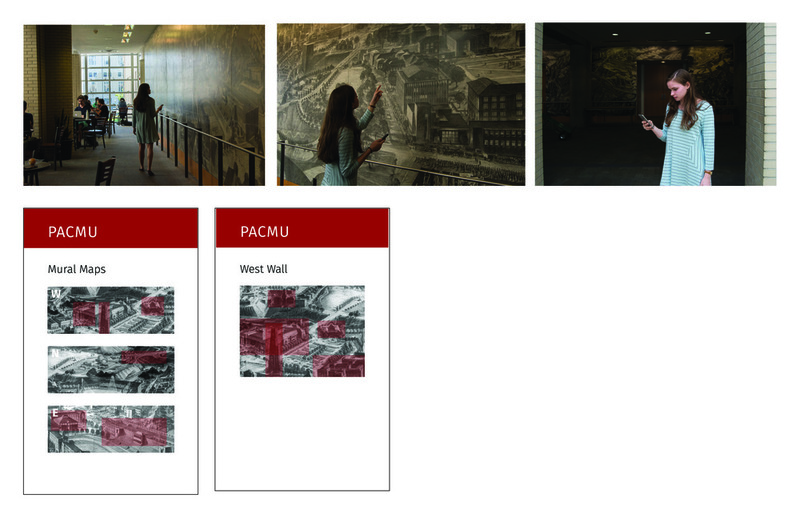 The Public Art at CMU (PACMU) app allows users to see the different art pieces located on the Carnegie Mellon University campus. Each point of interest is located on a map and identified by the relatively recognizable Google Maps ‘red balloon’ location icons. The user then clicks on that icon and is taken to a new page with information about the art piece at that specific location. The extent of the interactions only exists in two layers: the map and information pages. 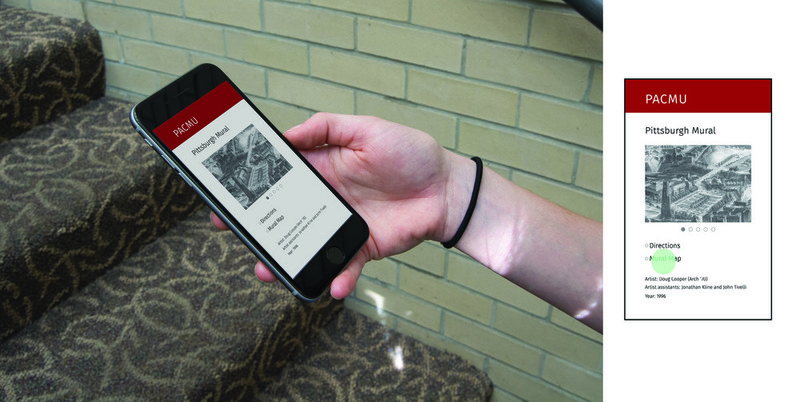 The app could have a purpose in multiple narratives. Thus, it should be accommodating and have multiple routes for different types users with specific goals. As of now, the only narrative being considered is a finger touching a screen. Also the interactions with the map should result in more calculated changes (size of location icons as the user zooms in and out) since the current scaling feels random. 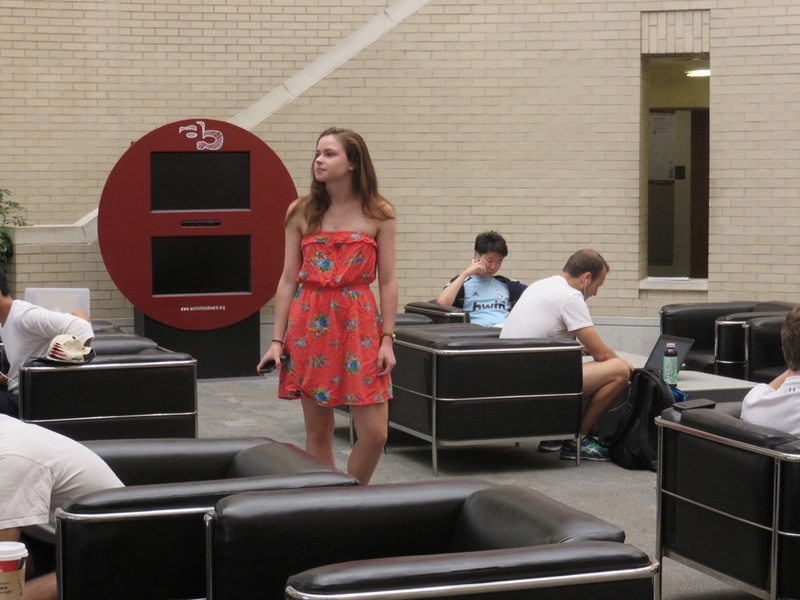 User: An accepted student in the University Center that wants to explore the building and learn about the history of the school and the city. 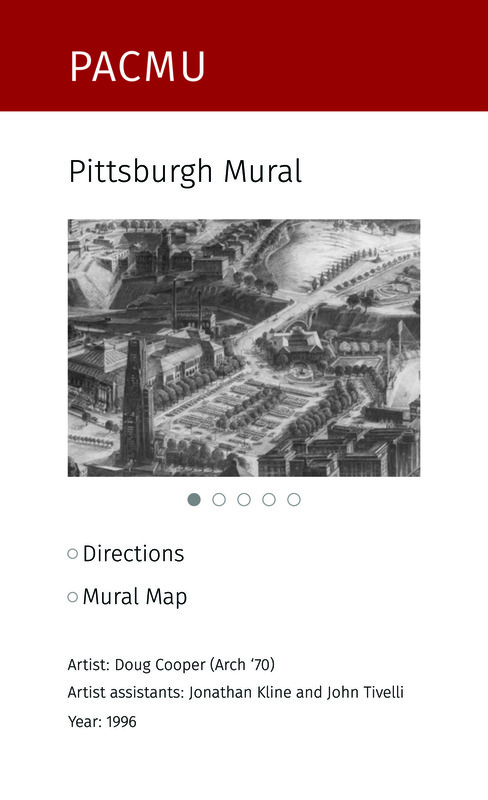 Goal: To get the user from the opening page to the information page about the Pittsburgh Mural in the University Center and navigate through the building to the actual art piece. I included full annotations and descriptions of the actions that the user would complete to move through the sequence. The image below shows the addition of my notes of the narration for each point. My goal was to create a sequence that directed the user through the space as well as teaching them about the art that they were about to experience. Thus, the user has some knowledge before they arrive at the art, allowing for a more thoughtful understanding. Then, I started to pair the wire frames with the photos that I took in the place where my narrative happens. This helped me to see the relationships and the parallels between what the user was experiencing through their phone and the physical world. Taking this organization, I started to create my final presentation. 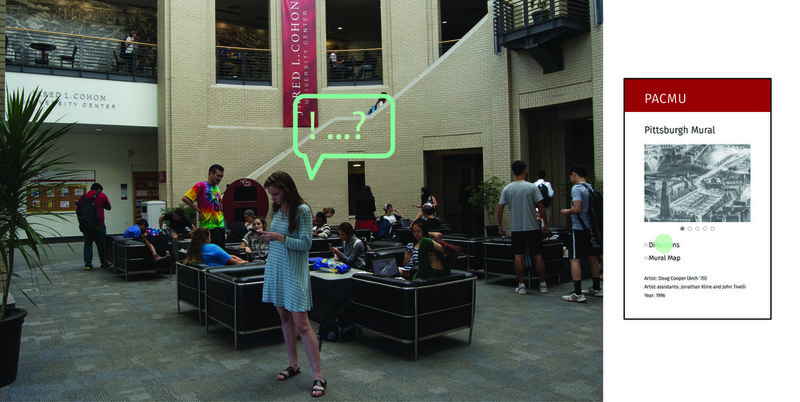 The final presentation shows the connecting thoughts and actions between the digital and physical environments. 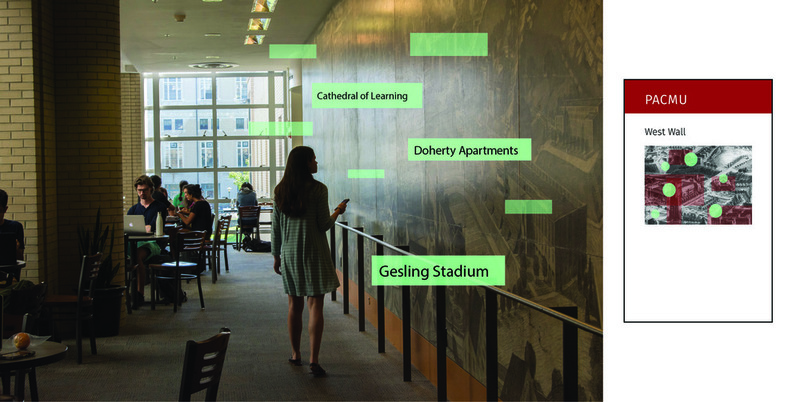 I added some graphics to the wireframes and photos in the same color (green) to show the presence of the connection throughout the narrative. The goal for this app is to create a hybrid environment where the optimal level of learning and appreciation take place.